I’m signed up for a couple of services that alert me to positions that churches are trying to fill. I see jobs for senior pastors, youth pastor, small group coordinators… but I’ve never seen the job of vampire hunter come up. It’s odd, because you’d think that position would have a lot of turnover. Perhaps, like me, you’d been unaware that vampire hunters were church employees, but I’ve seen this confirmed by not just one but two films this week: Van Helsing and John Carpenter’s Vampires. Doctor Abraham van Helsing was a character in Bram Stoker’s 1897 novel, Dracula. In the book, he’s an aged Dutch scholar whose knowledge is invaluable when a vampire attacks England. 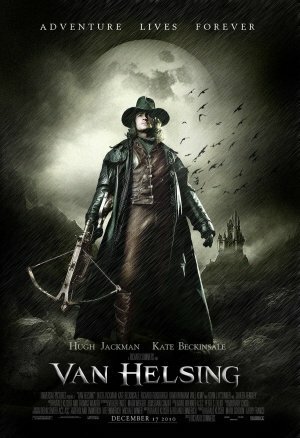 In the film Van Helsing, Hugh Jackman plays a stylishly dressed soldier hired by the Vatican to fight evil. He goes to Transylvania ten years before Stoker’s novel was written, accompanied by a friar named Carl who serves as a 19th century Q to the church’s James Bond, supplying Van with rapid fire crossbows (among other things). It’s a mess of a film, and we don’t get much clergy or church in the battles involving not just Dracula and other vampires but also werewolves and Frankenstein’s monster. Friar Carl curses and sleeps with a woman, explaining “I’m a friar, not a monk” when his actions are questioned. 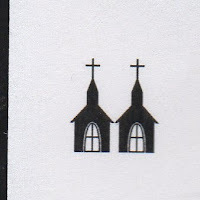 I don’t think the Roman Catholic Church has behavioral distinctions between the two. 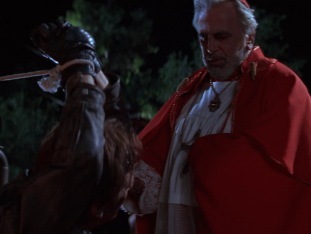 John Carpenter’s Vampires has more church and clergy in the plot of the film. (John Carpenter was the director of the film. I suppose his name was added because of the generic nature of the title.) Again, vampire hunters are employees of the Roman Catholic Church. We see a priest with a crew of fighters before they attack a vampire nest in a small town. Father Giovanni prays for the slayers and blesses their weapons, all in Latin. He helps where he can, but mainly asks, “What’s going on?” He does bless the vampires after they are killed, asking God to give peace to their souls. “I’m fine,” he responds. He also makes arrangements for the slayers’ payment from Rome. But the slayers didn’t get the vampires’ Master, and he attacks the party. The Master beheads the priest and kills all of the slayers but two: Crow and his right hand man, Anthony Montoya (Daniel Baldwin). One of the prostitutes, Katrina (Sheryl Lee), also survives the attack, but she is bitten by a vampire, changing her into a vampire. Crow then goes to see Cardinal Alba (Maximilian Schell). Crow wants to quit, but the Cardinal insists he must continue his work. 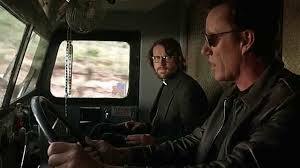 He assigns him a new priest, Father Adam Guiteau (Tim Guinee) who worked in the Vatican vampire archives and is familiar with Crow’s work. Crow asks the Cardinal if he knows anything about the particular Master who attacked the slayers. The Cardinal tells Crow that the Master used to go by the name of Jan Valek. He was a priest who turned against the church in the 1300’s and led a rebellion. He was captured and tried for heresy. A botched exorcism led to Jan’s bodily death, but his soul lived on; he became one of the undead, a vampire. Crow is taken aback by the information, saying, “So the first vampire was created by the Church.” Which I guess explains why the church feels obligated to hire vampire slayers. We learn that Crow was raised by the Church after his parents were killed by vampires, and he had been trained by them for his work. Crow, Montoya, and Father Adam go out in search of the Master. They get a clue when they learn that the Master attacked a church in the Southwest. The priest of the church, Father Molina, was a scholar of Church history in the United States, but he was kidnapped and killed. 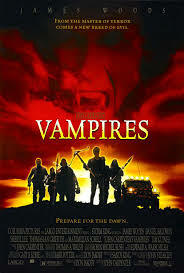 And artifact, the Cross of Belize, was stolen from the church (in this film, crosses don’t harm vampires). This Cross can, instead, be used to make vampires invulnerable to sunlight), but a priest must perform that occult ritual to give the invulnerability to the Master. Where, oh where, can the Master find a priest who would help him with this ritual? The slayers track the Master down to a ghost town. We learn that the crew has been betrayed by Cardinal Alba, who has stopped believing in God and wants the eternal(ish) life that the vampires offers. So Father Adam raises the Steeple rating for the church in this film, but Cardinal Alba drags it down. 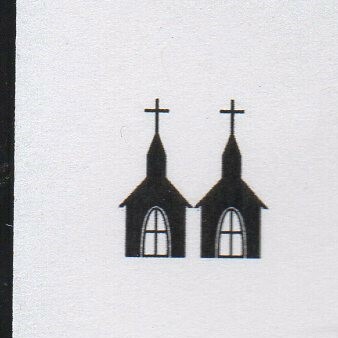 The average for the clergy in both films comes to Two Steeples.